I just discovered this artist through her eBay listing and thought porcelain collectors would like to see her work, since she creates dolls in a similar visual style to the porcelain artist dolls we like. Aaaaaand here is the girl I just purchased from eBay. I CAN'T WAIT to get her in the mail. She is absolutely stunning, in my opinion. Her name is Taira. Eeep so exciting! She is gorgeous. What ebay search where you using? The tiny one is super adorable! Congrats on your doll! I search for "bjd" on eBay, sort from highest price to lowest, and the types of dolls we like on this board are usually on the first three pages. /trots off to ebay to have some fun. I've only been searching "porcelain bjd" which is a good one, but doesn't include artist made resins like this one. Those are beautiful! Congrats on your gorgeous new girl! Nessa - I think you're going to have to put her behind a velvet rope at the next doll meet, surrounded by burly bouncers…grabby hands…. she's just lovely. Big congrats! Oh she is lovely, I cant wait for some pics! Oh the new one is so pretty too! ...just wanted to point out that the other Anya Dobryakova doll auction is about to end and no one has bid yet...35 minutes left! She is really pretty! SO...IN...LOVE...WITH...HER...! 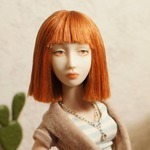 She's my first doll with double-jointed thighs and the first who can easily touch her face. 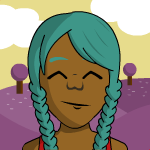 Im thinking of renaming her Genevieve. Anna told me she hopes to make some porcelains in the future. Yay! That is a good name for her! She is just perfect, she really is.